In policy and research, migration and the welfare state are often seen as being at odds. When ‘strangers’ enter the welfare state, the financial and social foundations of solidarity are said to crumble. A prominent question, therefore, is whether immigrants should have the same rights as the autochthonous population. Within this frame, migrants are often ‘objects’. 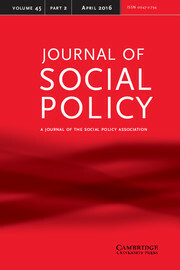 This paper reports on qualitative research exploring what different types of labour migrants themselves think about the Dutch welfare state in general, and about giving social rights to immigrants, in particular. The differences in national backgrounds and levels of education in labour migrants’ views are striking: lower-educated Turkish and Polish migrants show little interest in the welfare state, whereas higher-educated Western Europeans seek welfare state security. Higher-educated Indian migrants find the welfare state a totally new concept, although after a while some come to appreciate it. A significant proportion of the questioned migrants, moreover, believe that people should not be entitled to welfare state rights immediately upon arrival. They favour ‘earned citizenship’, with the welfare state being a ‘contribution state’, but stress that migrants should not have to wait too long before being entitled to such rights. The paper also suggests new topics for further research in the increasingly important field of migration, diversity and the welfare state.